Anti-doping expert Dr. Tom Bassindale says it will be difficult for Froome and Sky to fully explain Salbutamol test at 2017 Vuelta. Chris Froome has catapulted Salbutamol straight into the headlines. After the Team Sky star tested for double the allowed threshold, many are asking what is Salbutamol, how it works, and why it’s so popular in the peloton. To get some answers, VeloNews called up Dr. Tom Bassindale, an anti-doping expert and lecturer at the Biomolecular Sciences Research Center at the Sheffield Hallam University in England. A forensic toxicologist, he’s worked closely with failed doping tests due to contaminated supplements as well as Meldonium, a drug that made headlines in 2016. Bassindale is watching the Froome case with interest. VN: What was your first reaction when you read about the Froome case? Dr. Tom Bassindale: I was surprised that something as innocuous as Salbutamol would cause a positive test with Chris Froome. It’s an unlikely drug to take for performance-enhancing use. The evidence is quite mixed, and studies suggest toward it not being performance-enhancing. If you are an asthmatic, it only gets you back to ‘normal’ breathing, and there’s not a huge boost beyond that when taken as an inhaler. VN: What about the other banned methods of taking Salbutamol? DTB: You can also take Salbutamol via oral tablets, intravenously or a nebulizer [a kind of vapor mask], but those are going to be much more potent, and have a much larger effect. An inhaler goes directly to the lungs and relaxes the bronchial muscles to ease breathing. The other uses go into the whole system, including the blood system, and would have a larger effect. VN: So what’s your take on the one-day spike and results of Froome’s test? DTB: One assumes he was tested before and after throughout the Vuelta, and only this one day he had a spike in readings. That wouldn’t suggest long-term abuse. That day he said he had a significant increase in dosage with the spray, within the rules. They will try to explain it along those lines. There are also the less-innocent uses, and those are all banned. The not-so-innocent explanation would be the use of a tablet on top of his inhaler. There are the innocent explanations and the not-so-innocent. Now it’s up to them to make their explanation seem plausible. VN: Explain how Salbutamol works in its spray form? DTB: The spray will have an almost immediate effect. It opens up the bronchial tubes and relaxes the muscles that block the breathing. The puffers will only get you back to a ‘normal’ function. They cannot open the airways in any additional way. There is no extra benefit for anyone who might not be asthmatic. If an asthmatic took a few extra puffs, they might feel some mild stimulation. Like a jolt of caffeine. Beyond that, there are not much additional benefits to performance. VN: And via the other methods, how does that affect an athlete? DTB: With injections or tablets, you start getting some additional effects. You might see anabolic effects, such muscle-growing or fat-burning, similar to what Clenbuterol might do. That wouldn’t result from a couple of puffs. That would be a longer-term abuse with a higher level of it to get that anabolic effect, over weeks or even months. VN: There have been some reports it can be used as a masking agent, are those true? DTB: I have seen those reports, and I have not seen any scientific data to back that up. There might be some confusion because, on the banned list, Salbutamol appears in the masking agent section. If you were using Salbutamol with a diuretic, you would need a TUE for both those drugs. VN: And how does dehydration affect the outcome of a test? DTB: With thicker urine, and less water, any drug would appear in a higher concentration. 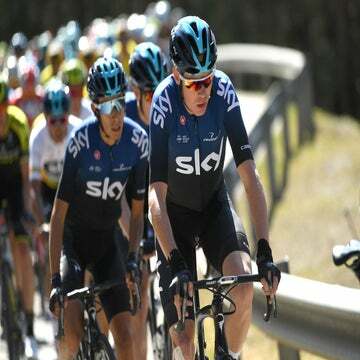 VN: Froome has said he hasn’t broken any rules — do you agree with that assessment? DTB: He hasn’t broken any rules as of yet. His sample was reported as an ‘Adverse Analytical Finding,’ but it isn’t yet an ‘Anti-Doping Violation.’ Now he has to prove he hasn’t broken any rules. That’s a difficult situation. You cannot take more than eight puffs in 12 hours, or 16 puffs in 24 hours. The threshold is there as a marker that suggests someone might have taken more than that. If he can provide urine above that level based on the doses he said he used, now he’s got that chance. He’s playing it a bit cute with the wording because he’s obviously under investigation because of the adverse analytical finding. Now he has to provide that information. VN: How does that work? Is it a question of providing documentation? Or undergoing lab tests? DTB: He has the opportunity to go into a lab under a controlled test, take the amount they said they took on the day — only up to the maximum because if they took more, it would be a positive right there — and they would collect the urine over the course of the day and see what readings they got. VN: How common is that? Is it because it was not an outright banned product, and rather a threshold product? DTB: I don’t know of too many cases where this has come up. It’s all being done quietly without reporting. The way the anti-doping world works, something similar to this would have leaked out before. I believe it’s fairly uncommon. There’s no provisional ban in this situation. That’s why he was able to race the worlds when he knew he failed this test. The regulations allow him the opportunity to clear his name before they might suspend him. The big question is the dose and the high concentration of Salbutamol in his urine. VN: If they’re going to provide evidence, will they try to recreate conditions from Vuelta? Go up on the side of a mountain, and undergo some hard efforts? DTB: No, it would be lab-based. There is no direct regulation that they should try to re-create the conditions. And it wouldn’t be on a trainer, either. I suspect it would be a lab-controlled study. They administer the drug and collect the samples. There would be baseline samples before he came in and then re-create the doses. I can imagine they would try to demonstrate he was dehydrated, whether or not they can recreate that, I don’t know. VN: There have been some comments, namely from Tony Martin and others, that the anti-doping foundation is playing favorites with Froome and Team Sky. Based on your experience, are those claims accurate? DTB: It would be interesting to see whether the same opportunity has been afforded to other people, whether people have had a chance to prove their case before being provisionally suspended. They’ve reported the ‘Adverse Analytical Finding,’ and they’re giving him the benefit of the doubt. Of course, that’s not the same if they found a substance like cocaine, a product that shouldn’t be there at all. Then a ban would be immediate. VN: What’s your guess, do you think a ban is likely? DTB: It would depend on how much responsibility the athlete bears on the case, and how much he tried to avoid a doping violation. The athlete does have the ultimate responsibility. If he just says the doctor told me to do it, that’s not really going to help him. But if he could demonstrate that he researched it, that he knew the rules, that he tried to minimize the risk, so that might be looked upon in more favorable light. VN: We’ve seen cases like this drag on months, if not years. What is your expectation based on what you’ve read so far? DTB: It depends on how long it takes to get his information together if he’s going to fight the case. Sometimes it can take months to years to get a completed ruling in some of these cases. It all depends on if WADA later appeals the ban if they don’t think it’s hard enough, or if Froome thinks its too hard, he can appeal as well. It can go on for a while. VN: There seems to be a prevalence of exercise-induced asthma among endurance athletes; is that an accurate reflection of reality? DTB: There have been reports that it can be developed in endurance athletes because of the prolonged efforts. By breathing through the mouth, get more allergens and cold air into your lungs. It does appear in a much higher percentage, because of the extra exertion. There might be more people in this generation population, but it’s quite hidden because they’re not making the continuous hard efforts as athletes. VN: From your experience, should Salbutamol be banned in spray form as well? DTB: I think their approach of allowing it to be inhaled in formal doses is a good thing. For the inhaler, it doesn’t appear to give much boost for those who are not asthmatic. It’s a first line of defense of asthma, so it’s a good way to regulate it. It’s quite pragmatic. VN: So what are your takeaway observations about this case? DTB: It’s so difficult to say actually. It doesn’t quite add up that a few extra doses have caused it to go that high in the urine. The number of times he’s been tested, and a number of days he might have used is quite high, so for one to go above that threshold is odd. It’s quite a change from the normal pattern. It’s not impossible, but quite a difficult one to see how he can fully explain that away.